Joanna has an inborn aim to understand and excel in every part of Real Estate, from creating strong client relationships to developing the correspondence that make deals work. Her charisma and professional manner have brought her the loyalty of both buyers and sellers. She is an attentive listener and a patient consultant, which brings solid work ethic and exceptional service. Living in the Marine Park area for over 25 years has given Joanna the knowledge and expertise that result in continuously earning her repeated clients and referrals. Originally from Park Slope she has had the best of two worlds, seeing this wonderful area as it was as a child and now this up and coming area of such beauty. The many businesses and buildings that have changed and the excitment of woking in this area again. 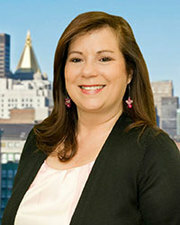 Joanna’s community involvement stretches far beyond her association with real estate. Aside having sold real estate in the Marine Park, Carroll Gardens and Staten Island area for the past 20 years. As well as dedicating her time altruistically to many good causes by volunteering with many charitable organizations that deal with issues of pediatric cancer, juvenile diabetes, breast cancer and fundraising for sports organization. How can you possibly not enlist her in the journey of buying or selling a home?